Motto Systems’ is an organization that has made pioneering strides in providing top-class enterprise quality management solutions (EQMS) to Life Sciences’ companies. Driven by innovation and backed by a qualified team of GMP domain and IT experts, Motto Systems’ is enabling organizations to overwhelm their pressure to remain competitive while meeting quality standards, through its range of innovative products. In addition, Motto Systems’ is inspiring companies to seamlessly achieve global regulatory and company-specific requirements with its revolutionary compliance management solutions. 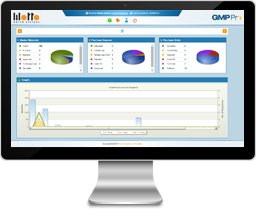 GMPPro is the flagship product of Mottosys. To be the first choice among customers and make a significant impact on their business with solutions that takes them to next level while ensuring a very quick Return on Investment. The goal of MOTTO is to be a leader in providing innovative products to its clients with advanced process technologies, domain-specific applications & long-term relationships with best in class service levels. Development is a continuous effort, where there is need to improve functionally and user friendly. A separate R&D team works continuously on various updated Regulatory requirements, new enhancements & modules, adoption of new technologies and quality of product.